My family LOVES bacon. So when we tested and found that our little man could not have nitrates the challenge became making bacon. We did not care that he could no longer eat processed meat as it is easy to bake beef/chicken/lamb etc and used sliced during the week for lunches but bacon was the breaking point. Did some research and this is the recipe I use on a monthly basis to supply the bacon lovers of my household. By the way this is very simple!! 1. Place all brine ingredients in a saucepan and bring to the boil. 1. On day of cooking, soak for at least one hour enough chips to fit in your smoker box. 2. 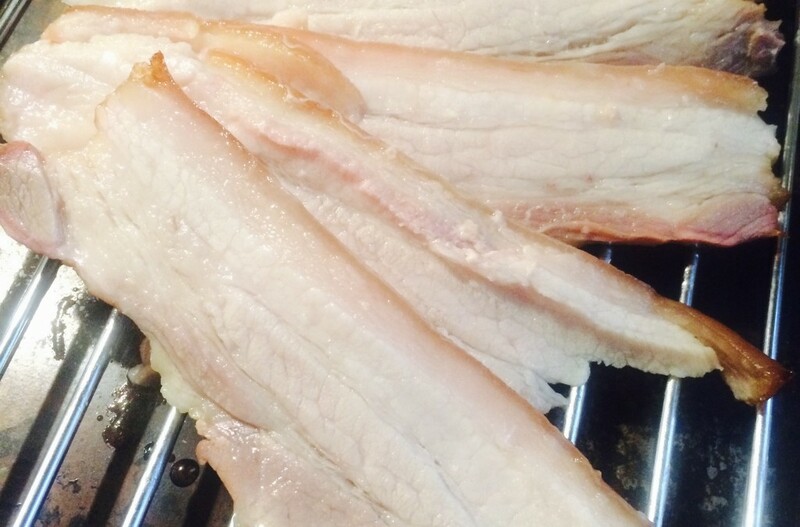 Discard brine and wash the pork belly and pat dry. We have a WeberQ and we do the bacon on large knob low (150oC) with meat on a trivet with foil tray underneath and it takes 2 hours. Once cooked remove and slice while still warm. Cook as you would normally do! Please store the majority in the freezer where it can last up to 3 months. Cutting: I used to cut the longest rashers but it got quite messy near the end. I now cut belly in half crossways then slice so that you get like a short cut bacon. If using a slicer make sure the rind is down.